The Grafton Cabin is a two-story log building, and was originally built in a mining camp named Grafton. The mining camp was deep in the mountains in an area claimed by the Warm Springs Apaches. It was frequently attacked by marauding Indians, and was virtually empty by 1890. In 1976, the City of Las Cruces obtained the only remaining building in the camp. It was disassembled and trucked to Las Cruces where it was reassembled on the Down Town Mall. It was operated by the Las Cruces Museum system, and was well maintained but only used sporadically. Recently a street improvement project dictated that the cabin be removed. 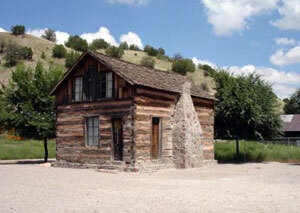 It was decided to return the cabin to Sierra County to be near its original location. The cabin is located within the Chloride Rest Area. It is anticipated that the cabin will be used as an Interpretive Center for the Apache Mining District which is located in the mountains west of Chloride.